DCM: Will the Dreamcast version vary from the PSX version? Kalisto: We take advantage of DC: High resolution, better visuals, higher frame rate. But the game remains the same - the plot and the actions. The team consists of personnel that have worked on the original title to give good continuity. DCM: What are the programmers' thoughts on the Dreamcast? Kalisto: DC is surely a powerful machine and very comfortable to work with. The lack of competitors makes it the best so far, but they're just around the corner. DCM: For the sequel, have you improved on the 3D environment - do you feel it has a richer, fuller, more organic feel? Kalisto: YES! The environment display relies on a brand new 3D-engine that fits our needs. We display more faces than ever and this is required to display fearsome monsters, glamourous heroes and a creepy background. The landscapes, streets, houses, pavements - all are built with a single purpose: to build a scary atmosphere. The technology we used just freed us from the texture memory limit, that's why we use a very large amount of high detailed textures. About the organic side of the game: the further you go into the game, the more you will encounter giant, tentacled creatures, some over 100 feet tall. DCM: How many polys make up the average character? Kalisto: The hero is over 700 polys, the monsters over 500 each. Bosses are more. DCM: In the first game you used motion capture and animation, has this been the same for NC2? Kalisto: We did trade the motion capture for talented animators. It was getting difficult to an efficient casting: ''Video game company search for talented four-tentacled open-ribcaged actor for motion capture. Large claws welcome'. 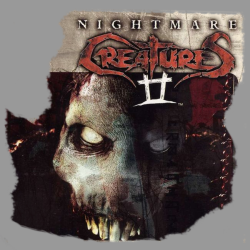 Seriously, the motion capture only renders true movements and that is good for some purposes, but on NC2 we needed monsters who behaviour reveals a human side through a beast's attitude. This can't be captured, hence no motion capture. DCM: London and Paris, as well as other city locales, are pivotal to the game, giving the story a richer look and feel. Did the team come to London, as with the first game, to get the feel and look right and add realism? Also, how deep have you gone into researching the areas, to give a faithful recreation for the hero of the game to explore? DCM: What were the drawbacks and limitations of the first title and have you now been able to overcome these in NC2? Kalisto: The new engine lets us use real 3D. You may have never have noticed, but in NC1 all the houses, everything, was was cut over five meters high. Now we can have the camera free to show whatever it needs to. The jump/climb ability of the hero is a great improvement too. We can also swim in NC2. In NC1 you actually died if you entered any water. We also exploded the memory limitation we had on NC1 by using asynchronous loading. We now have huge levels which have a great variety of locations, situation and textures. Nightmare Creatures 2 in action. Yeah, it's gory alright. DCM: How hard was it to create the right sinistar look and feel? Kalisto: That is the hardest part of it. Technical restrictions are so high that it is very difficult to render a creepy atmosphere, and even more so on the Dreamcast, where the rendering is so clean that it is...too clean. But I think the result now meets out expectations. DCM: How does the camera work, does it follow the action in an intelligent way and zoom in? Kalisto: The camera does a very complex job. It now has a larger range of action and provides a smooth vision of the action. It mostly keeps behind the hero. It lets the hero take a very large proportion (height-wise) of the screen (big characters are cool), keeping the area visible. DCM: Are there any strong links in story line between the sequel and the first game? Kalisto: The heroes have changed and the action takes place 100 years later but the evil villain is still the same, spreading creatures all around the place. The link is Adam Crowley and his creatures, hence the name of the game. DCM: Have you had to restrict any facets of the game, in case they were too gory or offensive? Is there a rating to the game? Kalisto: We expect to receive the most restrictive rating in every country and we fight every day to keep the content of the game unchanged. It is no longer about ratings but about censorship. I must confess that our publisher, Universal, is really helping us in keeping NC2 how it was designed. The game is gory, but we don't even hurt any humans. DCM: How is the story line objective conveyed? Is it via any narrative or merely through cinematic sequences? Kalisto: The game unfolds the plot itself. Of course, in-game cinematics with a voice-over explain a little more. Each level is started and ended by a video. The game features few lyrics, but most of the time pictures speak for themselves. DCM: Would you say the action/fighting scenes are as good as seen in most fighting games, or do you see this as secondary to the overall game? Kalisto: The game is above all an action game, a fighting game. Even if the way you fight is somehow different to a classic fighting game, it is all about timing, position and control. Rain always gives a game more atmosphere. I'd like to see less of it in real life, though..
DCM: How do the interface and controls work? Kalisto: In the most intuitive way we could find. You see your energy bar, the enemy's one when he is attacking you, the item selected - and that is all for the interface. We want the player to take full advantage of what is on the screen, not be disturbed by too much information. The controls are very simple; you can hit, kick, jump and use items. 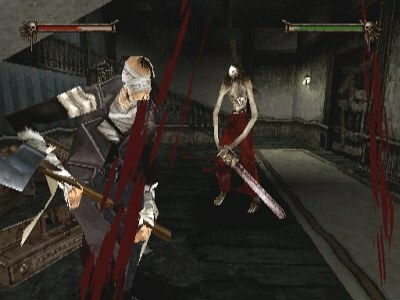 When a monster attacks you, your controls are extended in a 'fight' way and you can perform combos to cut limbs and do fatalities. DCM: What kind of combo moves are there? Kalisto: We reduced the number of combos since very few people used them in NC1. We made them more efficient. Depending on the monster you are facing, the combo will have various effects but mostly it aims at cutting limbs, the head or whatever stands out. You have two combos with two buttons, three with three buttons. You also have fatality moves that you learn to use at the right time. They provide a gory and definitive end to the fight. 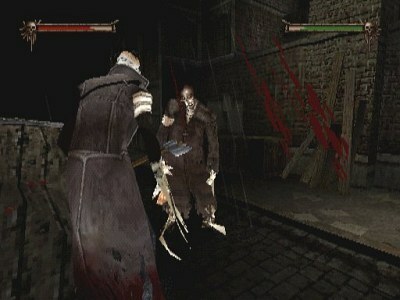 The monsters also have fatalities of their own to use on you. DCM: Nightmare Creatures 2 is billed as an action adventure spiced with puzzles, but how do they manifest themselves? Kalisto: This is not a puzzle game, as Tomb Raider can be. Finding your way is obvious. I mean even if it is not always obvious, you are not supposed to get stuck without a clue. Some keys are to find items that can help you through. When you find the object, you easily discover its purpose. For instance, a bolt cutter will help you cut a chain that blocks a door. The trick is more to have the hero explore every place using his sense of observation. For instance, blood doesn't naturally spurt from the ceiling. When you see that happening, you'd better wonder what's about you... The adventure is about exploration and finding items. DCM: You have mentioned 1500 exploration objects to pick up, use or break. This is a massive amount - can you give examples? Kalisto: To be accurate this is the number of items that have been modelled into the game. It features the pick-up-able ones, the interactive ones (mostly) and the decorative ones. It is big, but since the levels are also big, they had to be filled up with something. DCM: Is the world fully interactive? By that I mean, can you smash windows, or break things? Kalisto: You can act on a huge load of items. Of course, most of it is useless, but some hide bonuses or secret paths. There is no piece of glass you cannot break in the game (and chairs can be smashed too). DCM: How essential are the spells to Wallace and does he gain them as he progresses? Can you name some of the spells? Kalisto: The spells, as in NC1, are bonuses that help you get rid of some monster in a more spectacular way. For instance, the Jar of Flies, once broken, releases swarms of flies that enter the monster's head (if it still has one), shaking it from the inside before it...hmm...explodes. Toxic releases a toxic gas. Another one makes all the monsters bleed heavily from all parts of their body before they die. DCM: What kind of monsters will we come across? Kalisto: The 'emissaire' is one of our favourites. It is very smart and scares the s*i* out me. It has an almost human face, black and white painted, hands gloved in dried blood, a heavy tail, tentacles out of its rib cage and it uses a long Christian cross to hit you with. The 'spider' is also tough, with four arms and claws everywhere. There are loads to mention but we do not want to spoil things, so you must wait to play the game!